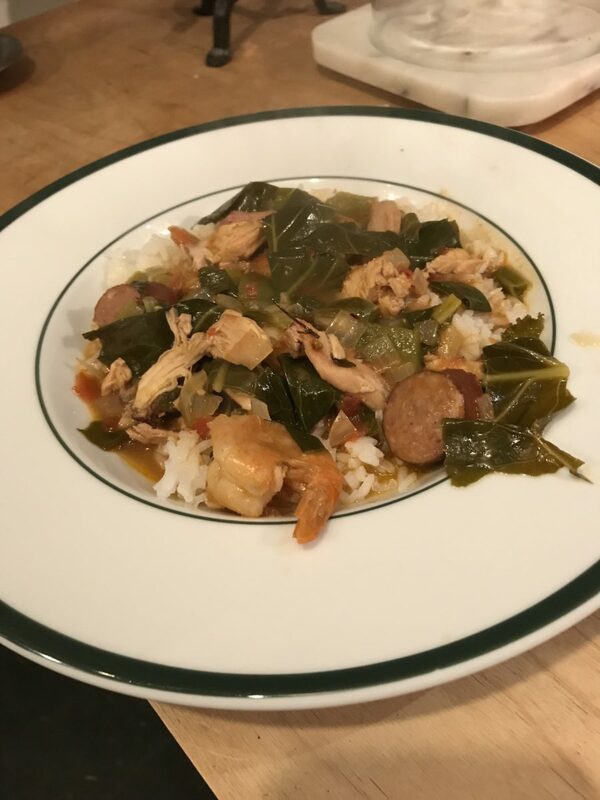 There are purists out there who will object to the use of collards in gumbo. I do so because 1) fresh okra is hard to find without growing it yourself in New England, and 2) I like the flavor that collards add to the stew. And I’d always thought of gumbo as somewhat improvisational: “Use file powder, no, use okra!” Like a lot of regional foods, there are significant variations, so I’m not going to lose sleep over altering this one to suit me. Start with the roux: Warm the oil in a heavy pot large enough to hold all of the stew. Add the flour and cook over medium low heat, stirring constantly, until it turns a rich brown, 20-25 minutes (alternately, make the roux in the oven: preheat oven to 350, mix flour and oil in dutch oven and bake until the desired color, 1-1/2 to 2 hours). Add the meats to the saute and stir to coat. Add the water or stock and bring to a boil, then reduce heat to a simmer and add the spices. Keep on a low simmer, uncovered, until the meats are cooked through and the gumbo is thick and rich, 1-2 hours.